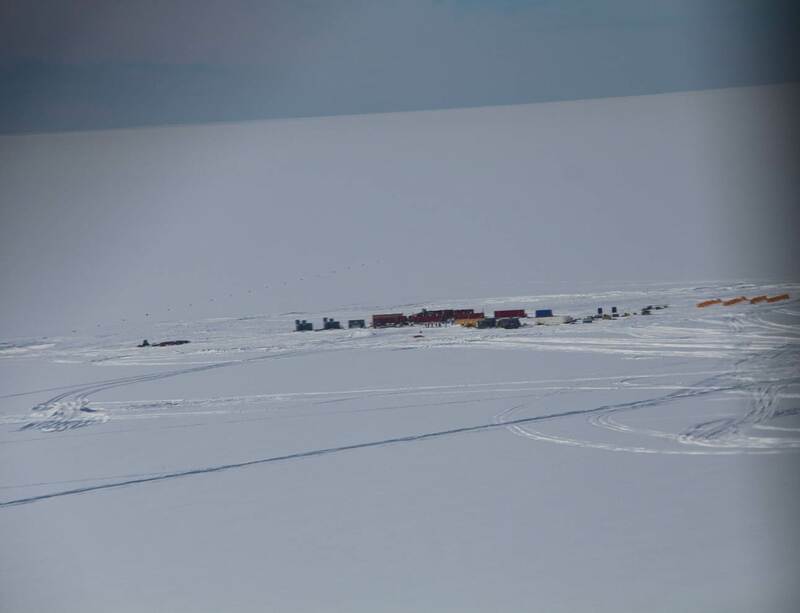 Image from the 625-mile, 14-day traverse from McMurdo Station to the Lake Whillans drill site. (Photo: Frank Rack, UNL). 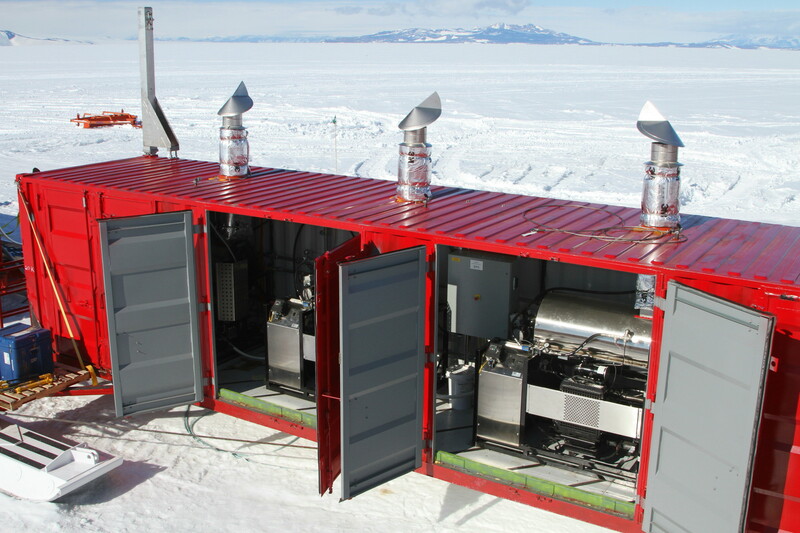 For the first time, a team of scientists and engineers has succeeded in drilling through the Antarctic ice sheet to reach a subglacial lake, and it was accomplished with a hot-water drill system designed and manufactured at the University of Nebraska-Lincoln. 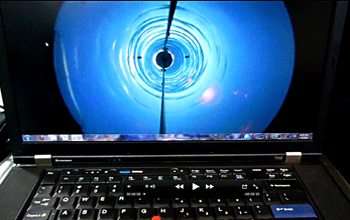 The National Science Foundation-funded team drilled a 30-centimeter-diameter hole through one-half mile of ice to reach Lake Whillans to retrieve water and sediment samples that have been isolated from direct contact with the atmosphere for many thousands of years. 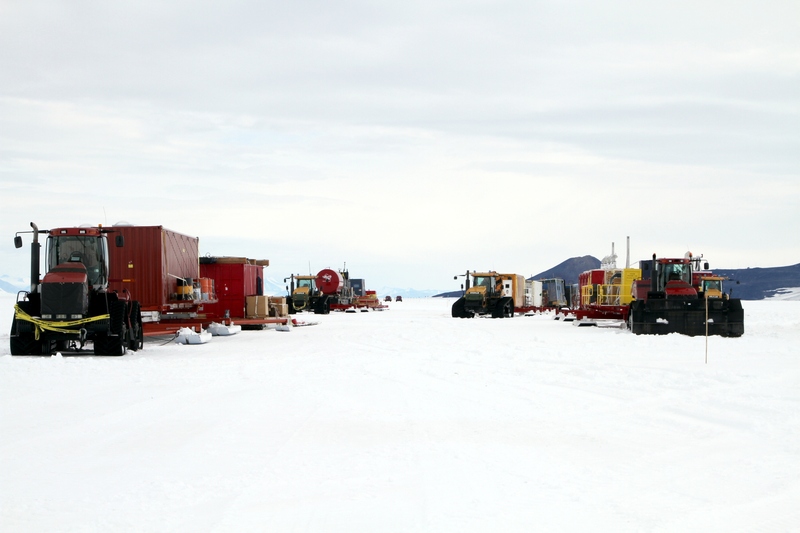 The interdisciplinary Whillans Ice Stream Subglacial Access Research Drilling (WISSARD) project broke through to the lake on Jan. 28 local time (Jan. 27 in the United States; U.S. operations in Antarctica keep New Zealand time). 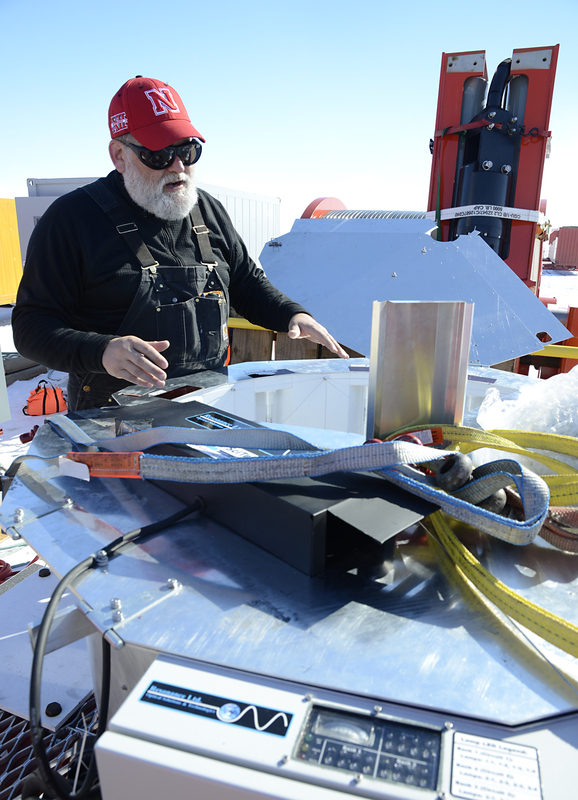 "We're very happy," said Frank Rack, an associate professor of Earth and atmospheric sciences at UNL and the executive director of the Antarctic Geologic Drilling (ANDRILL) Science Management Office at UNL. "The challenge of the drill was to ensure that everything worked together and we were providing enough heat into the ice to melt the hole and advance at a good rate, but also to keep everything clean," Rack said. Consider it mission accomplished for the drill design team from ANDRILL's Science Management Office, including senior research associate Steve Fischbein; and the team at the UNL College of Engineering's Engineering and Science Research Support Facility that built the drill in cooperation with engineers from the Northeast Professional Engineering Consultants Group of North Franklin, Conn., and Brainard, Neb. The drill provides up to 72 gallons per minute of 90-degree Centigrade (194 degrees Fahrenheit) water at up to 2,500 pounds per square inch and needed only about 24 hours on Jan. 23 and 24 to make the initial hole at Lake Whillans. The WISSARD team lowered a remotely operated vehicle called an M-sled that confirmed on Jan. 28 that the hole was open to the lake. "To make the final breakthrough took a bit of time," Rack said. "Our goal was to have the water from the lake flow into the borehole so we could enter with as little disturbance as possible. The purpose of the science is to collect samples of water, sediment and any biology that may exist in the lake, and they're going to do that through the deployment of a whole series of different scientific instruments that will go down on cables." 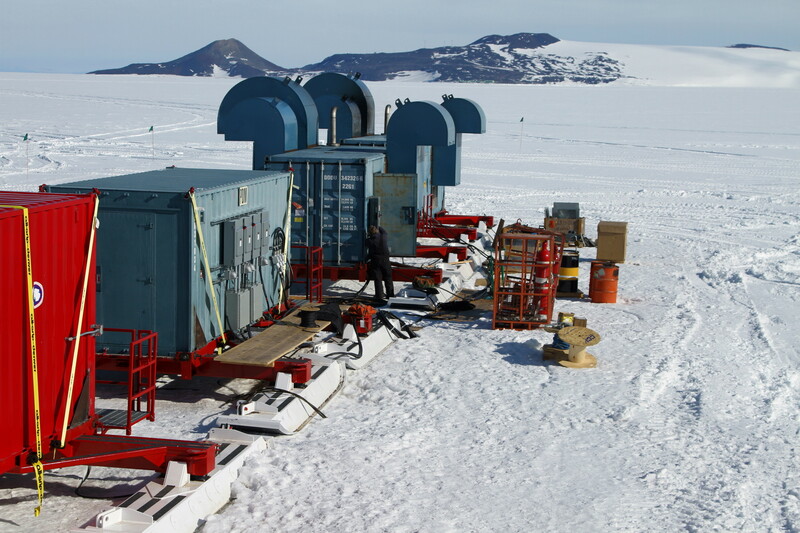 Rack said the drilling and the gathering of scientific materials all has to be done while preventing any contamination of the lake to meet the code of conduct for entry into subglacial environments that the scientific community in Antarctica has set up. That's accomplished with combination of filtration systems with meshes of 2.0 and 0.2 microns (1 micron is 1-millionth of a meter), germicidal ultraviolet radiation baths and physical cleaning systems that included hydrogen peroxide washes for the tools that go down the hole. The achievement is the culmination of more than a decade of international and U.S. planning and 3 1/2 years of project preparation by the WISSARD consortium of U.S. universities and two international contributors. Following their successful retrieval, the samples are being prepared for shipment off the ice and back to laboratories for chemical and biological analyses over the coming weeks and months. Building of the drill started in 2011 and half of the system went to Antarctica by ship in December of that year, and the rest of it was flown to the ice on C-17 aircraft last October through early December. The entire system came together for the first time in Antarctica and was tested by melting a 70-meter hole in the ice near the U.S. McMurdo Station on Ross Island. Then followed what may have been biggest challenge faced by the project -- the largest traverse in U.S. Antarctic history. 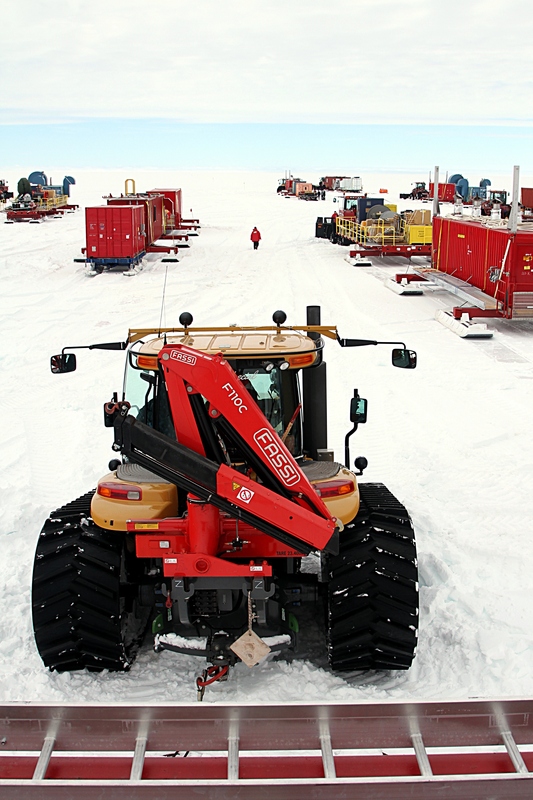 Thirteen tractors pulled 26 ski-mounted modules containing the drill and its accompanying science labs and camp infrastructure, weighing more than 500,000 pounds, 625 miles across the Ross Ice Sheet to Lake Whillans, a 1.2 square-mile lake near the southeast edge of the Ross Sea. 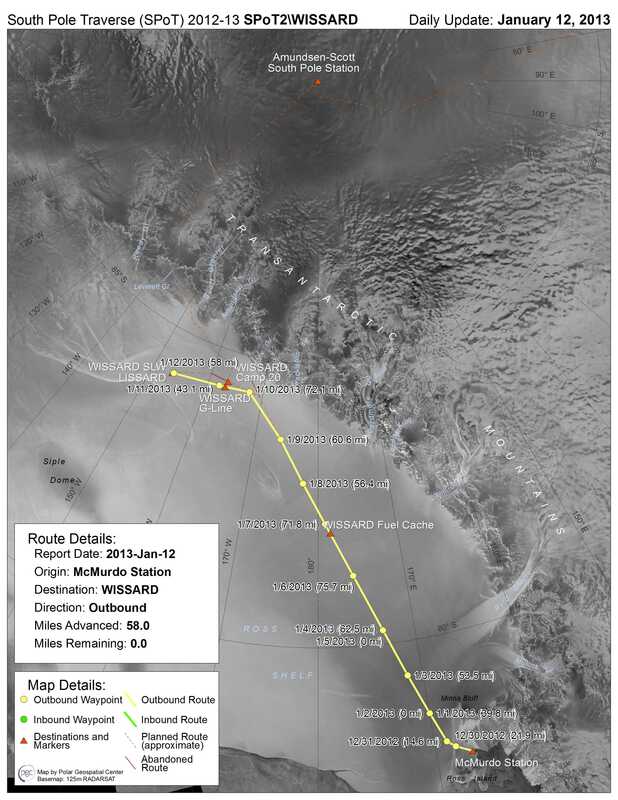 The traverse left McMurdo on Dec. 30 and arrived at the drill site on Jan. 12. "Not only did the drill have to work, but the whole system had to traverse this long distance mounted up on skis, so there was a lot of vibration and shock," Rack said. "The traverse team had to stop periodically to conduct maintenance on the containers and we learned a lot about how the ski kits and containers interact as part of an integrated system." The UNL team at the drill site was led by Dennis Duling, the lead driller and senior research project manager for ANDRILL. Other UNL personnel at the site included Daren Blythe, Justin Burnett, Chad Carpenter, Dar Gibson, Jeff Lemery and Graham Roberts. The crew that built the drill included Jim McManis, manager of UNL's Engineering Research Center, Dave Birdzel, John Hudgens, Mike Long and Mark Stroup. 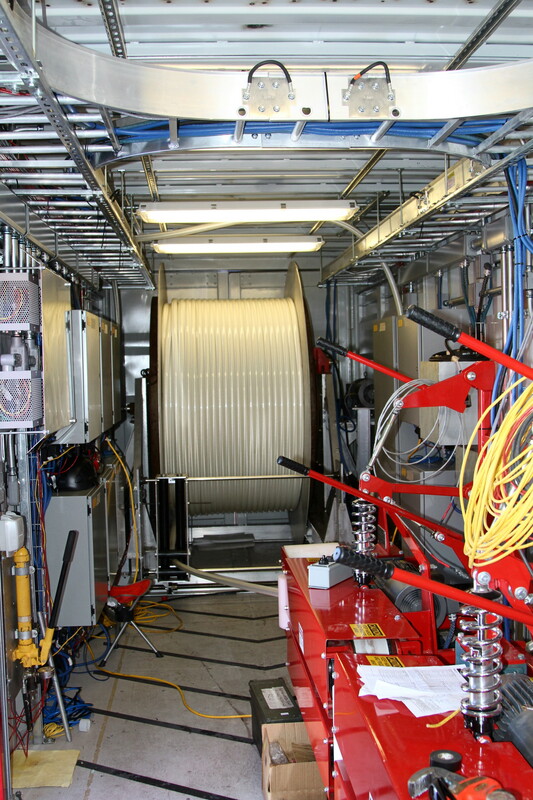 Total NSF funding for the WISSARD project was more than $10 million, with more than $3 million from the America Recovery and Reinvestment Act of 2009 to design and build the drill. "We created jobs and we retained jobs, and we helped U.S. manufacturing develop in new directions," Rack said. "For example, Alkota Cleaning Systems of Alcester, S.D., provided the pressure washers that were one of their largest systems of that kind. Flex Inc. of Mentor, Ohio, developed the longest hose and largest diameter hose that they've ever built. The hose is 1,000 meters long and an inch and a quarter internal diameter. We bought two of those hoses and several other smaller-diameter hoses." 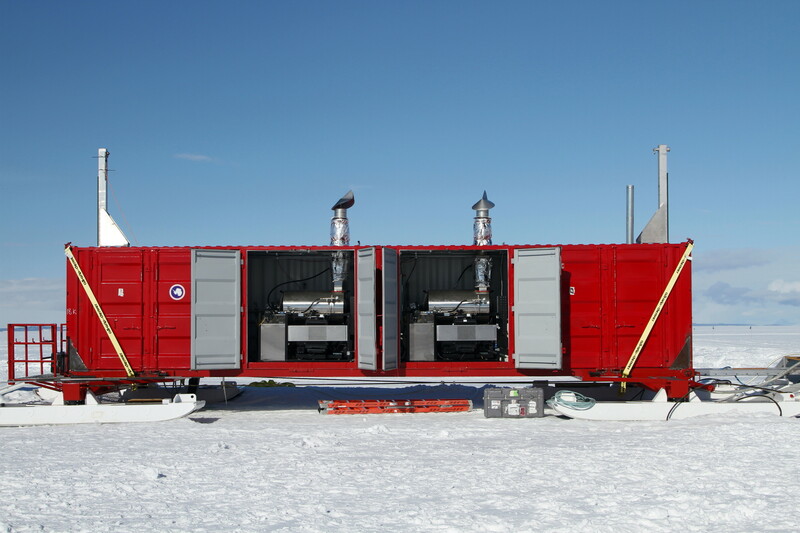 Wherever possible, Rack said, the project used off-the-shelf products to minimize spare part and resupply issues at the remote drilling site in Antarctica, but much of the drill system had to be custom-made. EAD Control Systems Inc. of Omaha created a command-and-control system for the drill that is essentially a large ethernet ring that is connected to sensors that monitor the whole system and allow the drillers to control it from laptop computers. 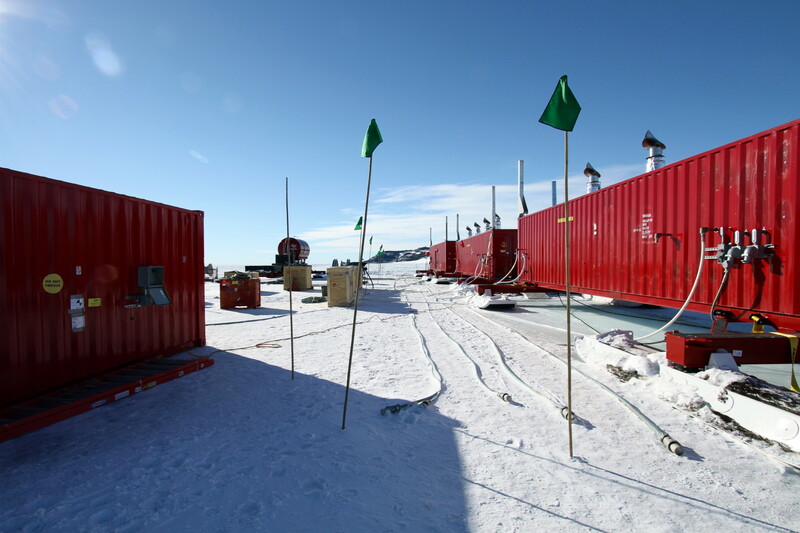 EAD's Adam Melby deployed to Antarctica to see the drill through its crucial testing phase on the ice shelf near McMurdo. Other vendors included Arapahoe SciTech of Tucson, Ariz., which worked with Resonance Ltd. of Barrie, Ontario, to develop the customized germicidal UV collar used to decontaminate the drill's hoses and cables; Corelube Equipment of Medicine Hat, Alberta, which worked with UNL staff to customize and provide the hose and cable cleaning systems; Interstate Industrial Instrumentation Inc. of Omaha, which provided the sensors in EAD's command-and-control system; Omaha Pneumatic Equipment Co., which provided hospital-grade air compressors with the help of Powerex Inc. of Harrison, Ohio; Tuttle Inc. of Friend, which provided the traction drive for the 1,000-meter drill hose deployment and recovery; and Ulmer's Dairy Equipment of Pulaski, Wis., which provided the main water supply tank and melt tank prior to their modification by UNL. The WISSARD Project is a multidisciplinary research project funded by the U.S. National Science Foundation, Office of Polar Programs (NSF-OPP), utilizing funding from the American Recovery and Reinvestment Act (ARRA). Any opinions, findings and conclusions or recommendations expressed in these materials are those of the authors and do not necessarily reflect the views of the National Science Foundation. The hot-water drill system (HWDS) development portion of the overall WISSARD Project is funded through three primary research grants from NSF-OPP, namely: (1) Lake Ice Stream Subglacial Access Research Drilling (LISSARD) at the University of California, Santa Cruz (PI: Slawek Tulaczyk, NSF-OPP ANT-0839142), (2) Robotic Access to Grounding-zones for Exploration and Science (RAGES) at Northern Illinois University (PI: Ross Powell, NSF-OPP ANT-0839107), and (3) Geomicrobiology of Antarctic Subglacial Environments (GBASE) at Montana State University (PI: John Priscu, NSF-OPP ANT-0838933).